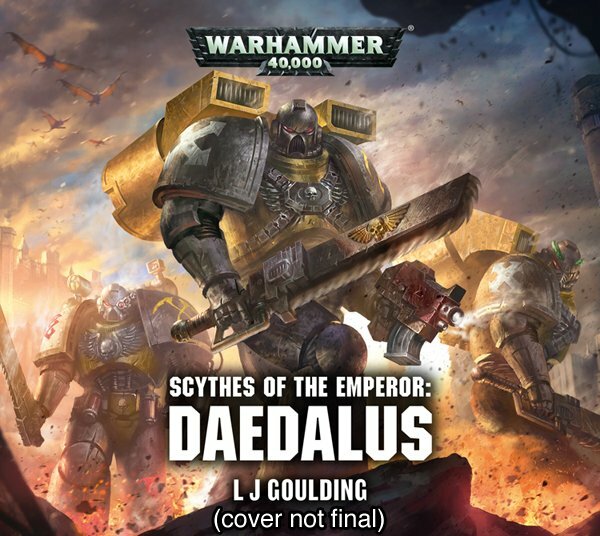 LJ Goulding has recently been interviewed by Track of Words, providing a well written and ranging conversation on Goulding’s origins and draw to 40k and without any bias on my part, rationale for the Scythes interest. I really recommend the interview, being one of the better pieces of content I’ve seen on the web of late. In a time when everything is becoming 140 odd characters, video only and published without an eye for spelling – it is a refreshing change. Besides the new novel in 2017, we have the audio book, Daedalus coming up soon. As a collector of the Scythes for many, many years; it has been beyond words to describe how glad I am to see the background fleshed out for The Scythes. It almost feels solely written for that unique enclave of collectors who chose a Chapter everyone left for dead. How little they know of Sothan tenacity. It is very satisfying to see Laurie discuss very similar touch points on why he chose to write about The Scythes. Each similar to myself when I noted this obscure chapter as a teenager, discovered a basic colour guide in Tyranid Attack and a notation – mostly destroyed. (Mostly). That was enough for me to collect and present the Chapter for two decades. I like underdogs and I dislike it when folks dismiss someone when they are down. So in the face of all this new content, how do I feel? After I sold off a large portion of my Scythes collection, I’ve been building toward a narrative campaign wherein a small band of the Scythes escape Sotha only to find themsleves a step behind the main body of Scythes who have retreated from Sotha to Miral and now beyond. There are tones of Bloodquest and touches of Ten Thousand as I explore the survival of this small band of marines on the small destroyer, Tenax. It is also a Rogue-Like adventure, in which if one falls. He’s gone. So stakes are pretty high and it will be interesting to see who makes it. In addition there will be a couple of antagonists besides the Tyranid and a couple of plots as the band of Sothans seek out their brothers in the Eastern Fringe. I am close to having the first elements ready and aim to expand on the story I began with their escape from Sotha. Lastly, Laurie gave a shout out to the site during the interview – thank you Brother! /salute. Look forward to publication day! Hi Sebastian, I just wanted to drop by and say hello. I hadn’t come across this site until Laurie mentioned it when we were chatting, but he talked about it with such genuine enthusiasm that I wanted to make sure I included it in the interview. I hope it came across in the interview just how involved Laurie is with this story arc – I’ve got a really good feeling about the novel!